OMG, I love me some P!nk. 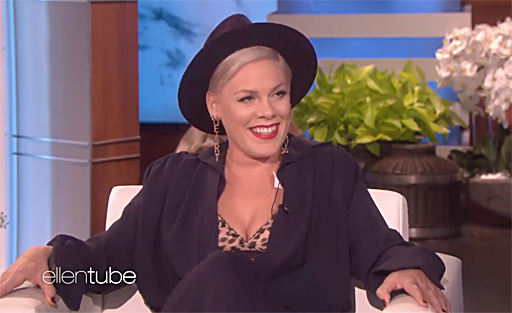 Sitting down with Ellen DeGeneres this week, international pop-star P!nk announced she has a new album called Hurts to Be Human coming out in the spring, and even offered an impromptu preview of the first single, "Walk Me Home." The singer chatted with Ellen about her 17-year relationship & marriage with husband Carey Hart; how if she were "truly happy" she would be 'useless' as a songwriter and artist; plus how she's really good at getting nominated for Grammys. To be clear, though, she has won 3 Grammys out of 20 nominations. I'm guessing she's just feeling a bit of the dry spell since her last trophy win in 2010. But, she's totally charming and fun. If you haven't seen P!nk in concert, make sure you do next time she's nearby. The best pop concerts I've ever attended.